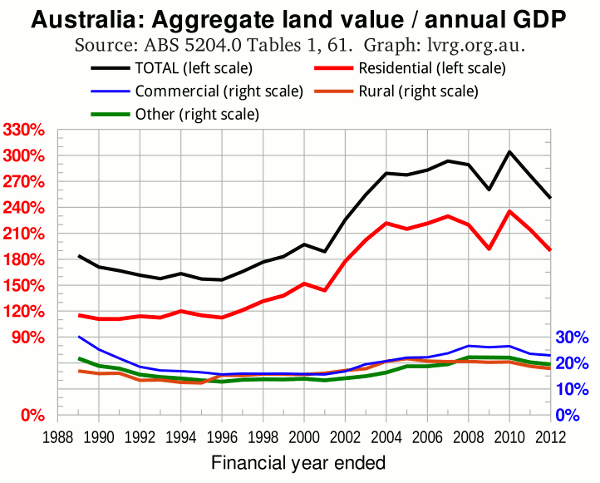 Aggregate land values in all categories have declined relative to GDP for the second consecutive year, writes Gavin R. Putland. In proportion to GDP, all aggregates declined for the second consecutive year, and the “total” and “residential” aggregates fell below their “GFC” minima. In nominal (current-dollar) terms, the “total” and “residential” categories again declined for the second straight year, but remained above the “GFC” minima. * The graph was corrected on Nov.3. In the first version, the curves were truncated at the right-hand end.